By offering this model I suggest that this is not at all logically incoherent, and moreover that this is a biblically faithful portrait of Jesus as well. We agree with the Council of Chalcedon that in Christ we have one person with two natures – human and divine. The soul of the human nature of Christ is the second person of the Trinity, the Logos. The human nature of Christ is composed of the Logos and a human body. The divine aspects of the Logos are largely concealed in Christ’s subconsciousness so that he had a waking conscious life that would be typical of any human being and that like the mass of an iceberg submerged beneath the surface so in his divine subconsciousness there lay the fullness of divinity. The waking consciousness was typically human. Those are the three planks of the model. The problem with these three planks is that planks 2 and 3 contradict plank 1. Plank 1 rests on the Council of Chalcedon, and that council states that Jesus is ‘perfect in humanity’ with ‘a reasoning soul and body’. The Chalcedonian Definition goes on to say, ‘the property of each nature [is] preserved, coming together into a single person [prosopon] and a single subsistence [hypostasis].’ If the soul of the human nature of Christ is the Logos, then Jesus does not have a human soul. That is a necessary aspect of having a full human nature; that is one of the properties of human nature as indicated by the Chalcedonian definition. That Christ is ‘perfect’ in his humanity means that his humanity is complete. Apollinarius’ original view was that Christ didn’t have a complete human nature. He had a human body but he didn’t have a human soul. He didn’t have a human nature. As a result he wasn’t really truly human. That calls into question the reality of the incarnation and also the effectiveness of Christ’s death on our behalf since he did not share our nature. What I argue in my Neo-Apollinarian proposal is that the Logos brought to the human body just those properties which would make it a complete human nature – things like rationality, self-consciousness, freedom of the will, and so forth. Christ already possessed those in his divine nature, and it is in virtue of those that we are created in the image of God. So when he brought those properties to the animal body – the human body – it completes it and makes it a human nature. Against Apollinarius, I want to say that Christ did have a complete human nature. He was truly God and truly man. Therefore his death on our behalf as our representative before God was efficacious. What he describes is honest-to-goodness Apollinarianism. The reason Apollinarius doesn’t give Jesus a human soul is because the divine Logos has taken the place of the human soul in Jesus. This is exactly what Craig is saying. As soon as the divine Logos takes the place of the human soul in Jesus, Jesus does not possess a complete human nature, even if Craigs wants to say that he did. To deal with the fact that a human nous and a divine nous, or human and divine hegemonika, could lead to something like Nestorianism, Apollinaris came up with the idea that the divine Logos took the place of Jesus’ human nous. This is what it means when we say that Apollinaris denied Jesus’ full human nature — he takes away the human soul and replaces it with the divine principle. And this is exactly with Dr Craig has done. I see here the ongoing problem of evangelicalism. Rather than immersing ourselves in the tradition, and sorting out what Chalcedon means, or what the ‘Neo-Chalcedonian’ resolution of the council meant 100 years later, or what St Maximus the Confessor meant a century after that, we look at the problem of the two principles in Christ — a human nature and a divine nature — and try to come up with a solution to the problem. What Dr Craig proposes here is exactly what I had once thought up about a decade ago, although he does it with better philosophy and more nuance. Although I am sharply opposed to his reading of Leo the Great, a good starting place for any evangelical looking at Christology is Robert W. Jenson, ‘With No Qualifications: The Christological Maximalism of the Christian East’, in Ancient & Postmodern Christianity by Kenneth Tanner & Christopher A. Hall. Here you get a taste of the Christological thought and trajectory of Greek theology from Justin Marty (c. 155) to Maximus the Confessor (d. 662). This piece, part of my introduction to patristics and ‘paleo-orthodoxy’, had a great impact on me and my vision of the absolutism of Christ’s divinity held in tension with his humanity. I’m not saying that Craig is not a clever man, nor that he is bad at philosophy. His bibliography demonstrates a thorough engagement with modern and contemporary philosophical movements. But he seems to be bad at historical theology. Not wanting to cast aspersions, since I don’t know his bibliography, this interview reads as though Craig had read a summary of what ‘Chalcedonianism’ is, what ‘Apollinarianism’ is, and what ‘Nestorianism’ is without having actually read a single Chalcedonian, Apollinarian, or Nestorian document. Perhaps I am wrong, and it is the brevity of the interview that is the problem. However, if that is the case, then I fear that Dr Craig has woefully misunderstood his reading of the Church Fathers. Craig is right that we need to safeguard orthodoxy against Nestorianism. Unfortunately, he has offered us, at least in this piece, something that is Apollinarianism. There is tension and mystery in all orthodox theology. We hold the tension that somehow God is three persons with a single essence/substance, that the Father is almighty, the Son almighty, and the Holy Spirit almighty, but there are not three almighties but one almighty. There are ways of elucidating the doctrine of the Trinity, and some of them are orthodox (Augustine, the Cappadocians) while some of them are not (Oneness Pentecostals). Jesus Christ is fully God and fully man, possessing a rational human soul and a human body, but is also the Second Person of the Trinity. There is a tension to this, and orthodoxy is maintaining a balancing act between Nestorianism and Apollinarianism. It is seeking to affirm the fullness of his humanity and of his divinity at the same time. Jesus Christ must have an actual human mind in order to be human. To have a divine mind that is pretending to be human is not to be human; the great anti-Apollinarian statement of Gregory of Nazianzus holds true, ‘What has not been assumed has not been healed.’ If Jesus Christ, Son of God and Son of Man, does not have a soul of the same nature as man, if all he has is a human body and a divine soul masquerading as human, then he is not just like me except without sin. He is completely different from me. A full human nature requires a full human psychology, not the parade or show of one. I could go on, and maybe I will in a future post, giving sign-posts for evangelicals on Christology. But here is yet another reason why people like me feel like we are increasingly on the fringe of the evangelical world as well as presenting the need for a robust evangelical ressourcement as called for by D. H. Williams, Robert E. Webber (‘Ancient-Future Faith’), and Thomas C. Oden (‘paleo-orthodoxy’). As it turns out, I was no big fan of Jenkins’ book and ended up not finishing it. Nonetheless, the Council of Chalcedon was a big deal, is a big deal, and will continue to be a big deal for time to come. Not only that, it’s a major reason that I am where I am today. Jenkins is right to point us beyond Nicaea to the other ‘ecumenical’ councils as defining moments in Christianity — and Chalcedon has ended up being one of the biggest defining moments. You may be surprised to read that. Indeed, several years ago I wrote a post about how Chalcedonian orthodoxy is not really that controversial. We mostly think of Chalcedon like this: Jesus is fully man and fully God. The end. The thing is, the affirmation of Nicaea at the ‘Second Ecumenical’ Council at Constantinople in 381 established the fact that God is Jesus, that Jesus is homoousios — consubstantial — with the Father. The church within the Roman Empire also rejected a fellow named Apollinaris whose teaching subverted the full humanity of Jesus. The question that arose in the fifth century was not, ‘Is Jesus fully God and fully man?’ but, ‘How is Jesus fully God and fully man?’ Dietrich Bonhoeffer may have been right in his Christology, and asking such questions was not necessarily the right thing to do — but they were asked. Once asked, a question cannot be unasked. And once answered, however imperfectly, it cannot be unanswered. The church had to come up with an answer that was both philosophically coherent and biblically faithful. Now, you may be partisan to a different ecumenical council. That’s fine. Allow me to explain why Chalcedon is such a big deal. The Council of Chalcedon is such a big deal because it was not universally accepted. 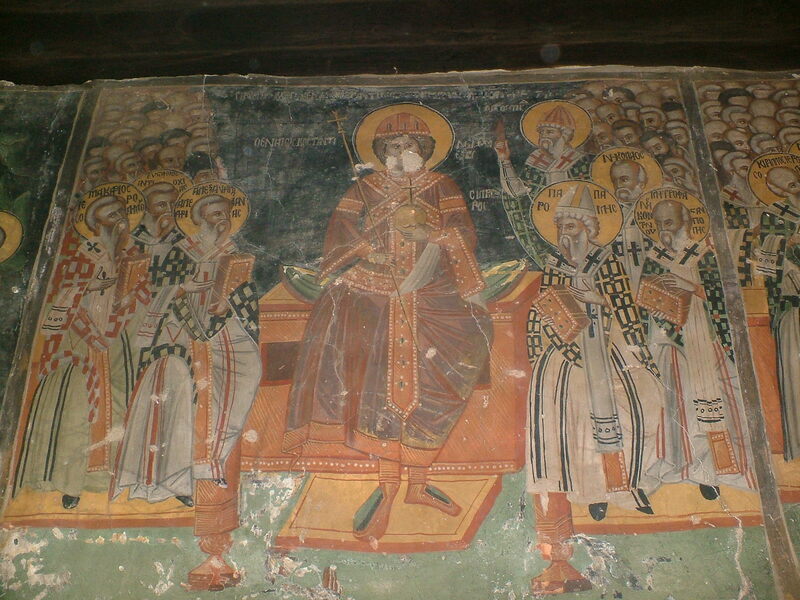 The Council of Nicaea, after the conversion of the Homoian (‘Semi-Arian’) barbarian kings in the Early Middle Ages, has become universally accepted (we set aside modern heretics who have resurrected Homoian and Arian thought). This is part of why it’s a big deal. Along with it, First Constantinople of 381 is also usually tacitly accepted, because a version of its creed is the one that even the ‘Nestorian’ Church of the East recites at the Eucharist. After First Constantinople, the next council in our list of ‘ecumenical’ (or ‘universal’) ones is Council of Ephesus of 431. It is rejected by the Church of the East. That should make it a big deal like Chalcedon. And it is a very big deal, and I recommend you get to know it. However, the Council of Chalcedon is somewhat larger a deal because the Church of the East’s roots lie beyond the Roman Empire. Its story, little known to us in the West, is a different story. It is a story worth knowing, with its own contours living in the Sassanian Persian Empire, then under the Caliphate, and reaching as far East as China — but it is a different story. In other words, the Church of the Roman Empire, in which Roman Catholics, Eastern Orthodox, Protestants, as well as Copts, Syrian Orthodox, and Ethiopian Orthodox, find their heritage, came to accept Ephesus. As did the church in Armenia. This is why the Council of Chalcedon is such a big deal. Yes, the Church of the Empire formally accepted Chalcedon. But many of her bishops in the Greek East fought against. Some emperors tried to bury it and ignore it. Justinian called a Fifth Ecumenical Council in 553, the Second Council of Constantinople, to try and deal with the divisions surrounding Chalcedon. He also issued various edicts beforehand, trying to find ways of framing theology that would both affirm the doctrine of the Council of Chalcedon and reconcile the growing Mono-/Miaphysite movement. 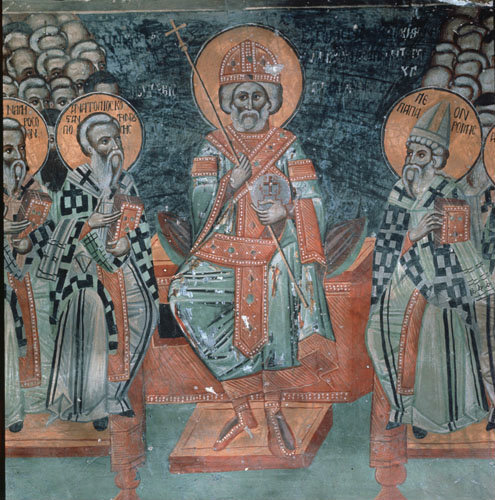 Similar attempts at interpretation and framing of the Fourth Ecumenical Council also led directly to the Sixth Ecumenical Council, the Third of Constantinople, in 681. Depending on which side of the many refractions of Chalcedon and its reception or rejection you found yourself on, you could end up imprisoned, or with your tongue cut out, or exiled to Petra, or stripped of ecclesiastical rank, or elevated to the episcopate, or given charge of a monastery, or any number of various situations, good or bad. You could find yourself in schism with Rome. You could find yourself in schism with Constantinople. You could find yourself hiding out in a monastery in Constantinople making Latin translations of the Greek acts of the Council of Chalcedon. You might write a very long theological treatise defending certain aspects of Chalcedon. You might write a series of theological tractates excoriating Chalcedon and Pope Leo, whose theology it approved, for heresy. You might compile a set of miracle stories proving Chalcedon true. You might compile a set of miracle stories proving Chalcedon false. The Council of Chalcedon is one of the most significant events of the Late Antique Church, and we need to realise that its teaching and the reception of that teaching has shaped and moulded the lives of thousands of people for 1500 years. I believe that understanding the theology and fallout of Chalcedon, skimmed over above, is especially important for western Christians today. First, most of us would agree with Chalcedon if we knew what it taught; many of us are members of ecclesial bodies that affirm the Christological teaching of the Council of Chalcedon. By knowing who we are, what we believe, and why, we can live confidently in a world increasingly unmoored and harbourless. Second, the world is not boxed off as it once was. The Internet makes it easier to encounter our fellow Christians from the eastern churches who reject this council. Understanding Chalcedon makes it easier for us to understand and love them. Furthermore, as war, terror, extremist Islam and secular (including economic) unrest shake the foundations of peaceable life in the Middle East, Middle Eastern Christians are finding their way West. Some are Chalcedonians in direct, unbroken descent in the Greek tradition, such as the Antiochian Orthodox Church and the Eastern Orthodox Church of Alexandria. Some are Miaphysites who reject Chalcedon and teach that Jesus has one nature, one will, and one energy — the Coptic Orthodox, Ethiopian Orthodox Tawahedo, Syrian/Syriac Orthodox, and Armenian Apostolic Churches are amongst them. Some are ‘Nestorian’, such as the Assyrian Church of the East — many Iraqis who flee West belong to this church. There are other groups with a messy relationship with Chalcedon, such as the Chaldean Catholics, who are in communion with the Pope but try to accept both Theodore of Mopsuestia (the great teacher of Nestorius, condemned at Second Constantinople in 553) and Cyril of Alexandria (the great nemesis of Nestorius, victor at First Ephesus in 431). Christian history is not dry and dusty and irrelevant. For the Christians of the Middle East, it is a living, breathing reality that permeates their lives. By coming to understand it better, we can love them better. Everyone who reads Gregory the Great’s letters — showcased by me here — will be drawn to different things. Social history, life in Sicily, Lombards, political history, and so forth. Because of my research interests (papal letters in Late Antiquity & Leo the Great in particular), I was drawn largely to things he had to say pertaining to canon law as well as to the Istrian Schism (on which, see below). I consider indeed that one must be vigilant and take all care that a bishop (rector) is pure in thought, outstanding in action, discrete in silence, useful with his speech, very close to individuals with compassion, more uplifted in contemplation than all others, allied with those doing good through humility, but upright with the zeal of justice against the vices of wrong-doers. … Again, when I bring myself to considering what sort of bishop he should be with regard to compassion and what sort with regard to contemplation, I consider that he should be both very close to individuals in compassion and elevated before all thers in contemplation. … For of course good preachers not only seek through contemplation the holy head of the Church up above, that is the Lord God, but by showing pity they also descend down below to its limits. Gregory then describes the ‘Three Chapters’. I’ve discussed these here before — they are a letter by Ibas of Edessa, passages of Theodore of Mopsuestia, and passages from Theodoret of Cyrrhus that Justinian proclaimed heretical first by edict then by council at the Fifth Ecumenical Council in 553. Because Pope Vigilius ended up subscribing to the condemnation of the Three Chapters, a schism resulted between Rome and many of the churches of northern Italy. It is often called the Istrian Schism. as for that synod which was held afterwards in Constantinople, which many call the fifth, I want you to know that it established and decided nothing contrary to the fourmost sacred synods. Indeed, nothing was done in it about the Christian faith, but only about persons, and about those person who are not mentioned in the council of Chalcedon. This I am unsure what to do with, since two out of three persons mentioned in the Three Chapters were explicitly at Chalcedon, discussed, and reinstated into their bishoprics. Indeed, this is the nub of the issue in the Istrian Schism. If we reject the teachings of Theodoret and Ibas, are we rejecting Chalcedon? We also delcare that whosoever thinks other than these four synods did, is an enemy of the true faith. And we condemn whomsoever they condemn, and whomsoever they absolve, we too absolve. We strike down under the imposition of anathema anyone who presumes to add or substract from the faith of these same four synods, but especially the Chalcedonian, over which doubt has arisen in the minds of ignorant people. In other letters North, Gregory pleads for the bishops to return to communion with Rome. Schism and heresy are diseases to Gregory. As a good shepherd, he needs to root them out for the healing of his flock, as he says in Ep. 4.35 about Donatists in North Africa. From these passages and many others, I believe that Gregory tried to be a good bishop, a shepherd overseeing his flock — a man of compassion and contemplation. I thank the Lord for men like him in whose spiritual tradition I stand, even if I am wounded by the pain of schism.